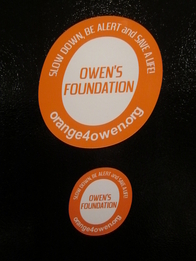 Orange 4 Owen bracelets in adult (8 inches) and youth (7 inches) sizes are available for a suggested $2 donation for each. An orange fleece scarf with a white letter "O" is available for a suggested $8 donation. A plain orange fleece scarf is available for a suggested $4 donation. All scarves measure 5 feet in length. 6" car magnets for a suggested $5 donation. Also smaller 3" magnets that are perfect for refrigerators, filing cabinets and the smaller areas of your car for a donation of $3 each. 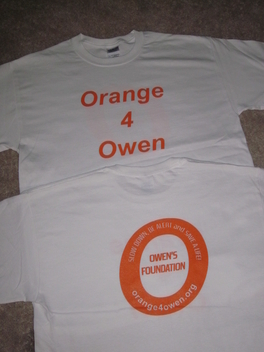 Orange 4 Owen T-shirts for a suggested donation of $8 for all youth sizes and $10 for all adult sizes. See order form below.